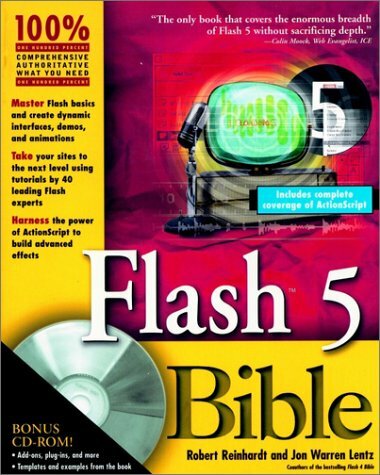 The Flash 5 Bible is the most comprehensive and exhaustive reference to the greatly expanded interactive and programmatic features of Flash 5. It's predecessor, the Flash 4 Bible, is widely regarded as the keystone book on the subject of Flash 4, and has been translated into more languages than any other Flash related book. This is more than a simple revision of the prior edition. In fact, we've added so much new material and extended both the depth and breadth of our coverage to such an extent that the book has more than doubled in page count! This is a real-world book: our lessons, examples, and explanations are based in real experience and application of Flash to many different projects. Furthermore, we've expanded the wealth of expert tutorials to bring you tips and techniques from over 40 of the top names in the Flash industry, so that you can benefit their years of expertise. If you're a Flash novice, the Flash 5 Bible will help you get started on your first day with the program and, when you've attained mastery of the program, it will remain at your side as your central reference and resource. But Flash is not just one tool. You can think of Flash as a multitasking application: it's an illustration program, an image and sound editor, an animation machine, and a scripting engine, all rolled into one. Accordingly, with this revision, we've restructured our book to better handle each of these components, in depth, and to better explain how each component works with the other parts. Part I of the book is dedicated to a detailed explanation and documentation of the Flash interface. It explains the specific function of every tool, command, and check box - with a ton of tips and tricks thrown in along the way. This is the only reference that delivers this much information. In fact, Part I is larger than most books that purport to cover Flash in its entirety. In Parts II and III you'll learn everything you need to know in order to draw, animate, and use sound in your Flash movies. Flash 5 introduced a new interactive language and syntax called ActionScript, which enables interactive designers to write code much more easily and fluidly. Accordingly, Parts IV, V, and VI are devoted to Interactivity, ActionScript, Games, and the integration of Flash with Generator and other server technologies. In these chapters, you'll learn how to solve interactive problems, how to make functions and arrays, how to detect Movie Clip collisions and how to use Smart Clips. We also show you how to create Flash forms, load external XML content, and use HTML text fields and properties. We conclude our coverage of ActionScript with an entire chapter dedicated to advanced Flash movie examples. It's no secret that some of the most unique and compelling content delivered in the Flash format is being created with the additional capabilities of other programs. Consequently, the penultimate section of the book, Part VII, is dedicated to the use of Flash in concert with most of these other programs. When you are looking for clues to help you integrate Flash with these programs, you'll know where to turn The final section of the book, Part VIII, covers the distribution of Flash movies: as web content, as screen savers, as freestanding applications, or as CD-ROMs. In all of these areas, our method, combined with a wealth of expert tutorials, offers a comprehensive and complete treatment of the most advanced methods for the delivery of Flash content. In addition, the CD-ROM includes many of the source .FLA files and most of the original artwork that is presented as examples and lessons in the book. It also includes trial versions of Flash 5 and other Macromedia products, as well as many of the applications discussed.